Following an ordinary stint on the market, the Royal Enfield Continental GT 535 is no longer available. While the motorcycle is a cafe-racer, the owner of this particular Continental GT 535 probably wanted to take the beaten path. 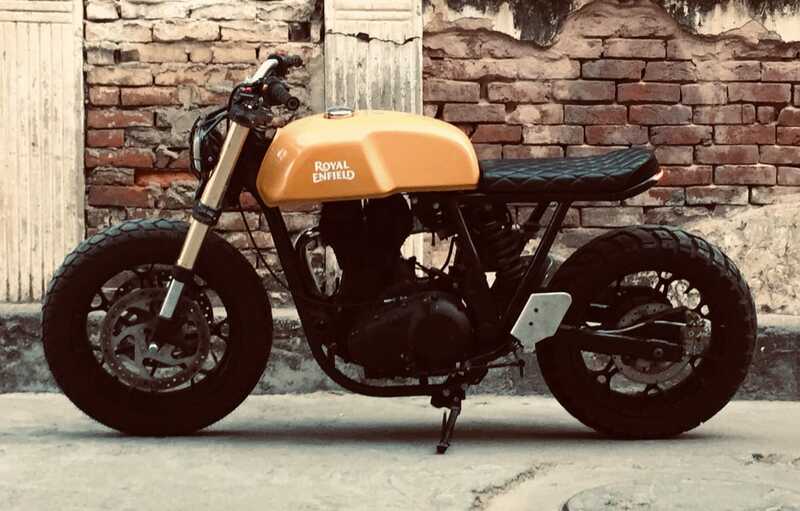 Thus, he added a bit of Himalayan and Interceptor INT 650 persona to the hardware, and the result is a beefed up Continental GT that has been transformed into a scrambler. In fact, the only recognisable bit from the base motorcycle is the fuel tank. The updated suspension setup includes upside-down telescopic forks at the front and a monoshock at the rear. The braking department has been given an overhaul too, and the front now features dual-discs. Up front, the fascia trades the retro-style headlight for an aftermarket twin-pod unit. The illumination tasks are taken care by halogen headlights. The front gets an off-road character with the use of a headlight grille. The fender has been removed, exposing the fat, dual-purpose rubber. You would notice that the stock wire-spoke wheels have been traded for a pair of aftermarket alloys. Ergonomics have been revised, and the clip-on style handlebar has been traded for a tall-set, single-piece unit that seems to have been sourced from a KTM Duke motorcycle. The tall handlebar gives an upright right stance and better access to the steering while standing on the footpegs. The fuel tank, as mentioned above, is retained in stock design. The tank recesses make the unit leaner towards the rider, giving a good amount of space to move around while off-roading. The retro-style, chrome fuel filler cap has been retained too. However, the sub-frame has been shortened that gives the motorcycle a compact look. The stock motorcycle comes with a rider-only saddle with a longer seat as an accessory. The shortened sub-frame on the modified Continental GT 535, on the other hand, is designed to accommodate a rider-only seat. The saddle gets a diamond stitch pattern that enhances its retro character. The minimalist tail includes a sub-frame mounted LED tail light while the rear fender has been eliminated. There is no provision to install the rear number plate in the pictures although it would most likely get a side-mounted unit. The sides reveal an aftermarket exhaust. The braking department has received an upgrade too, and twin discs at the front and a single disc at the rear now perform the anchoring tasks. The combination of the yellow fuel tank with blacked-out parts gives the motorcycle a very subtle, yet stylish persona. Revised ergonomics have been achieved with the use of a tall-set handlebar. The unit will also offer better accessibility while off-roading. You can see your prized possession on one of the biggest motoring portals in the country. 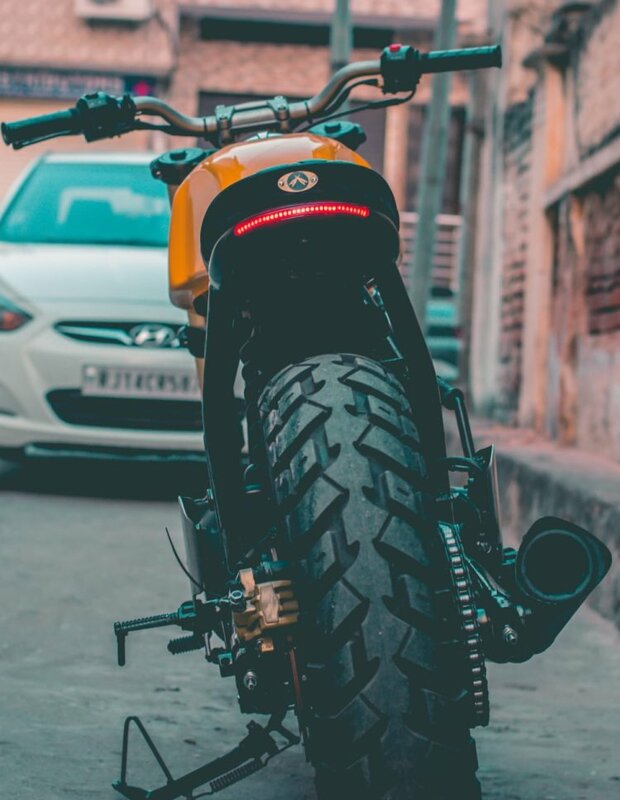 Email the photographs and details of your custom bike to suvil@indianautosblog.com, and if it is appealing enough, we will feature it on our website!